Sanicat 7 Days Aloe Vera Cat Litter gives you an incredible range of advantages all in one pack! Aloe Vera 7 Days is an innovative, natural litter for adult cats and kittens. Comfort, safety and maximum hygiene for you and your cat are the cornerstones of this cat litter. 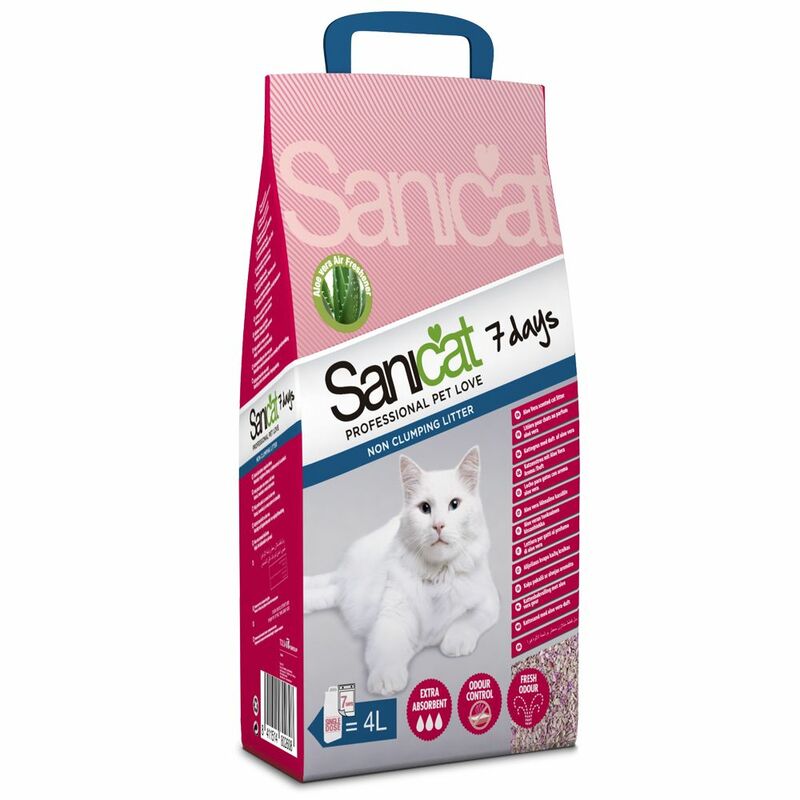 The highly absorbent litter, plus the longlasting scent means this Sanicat litter contains everything you need to keep the cat loo clean and free from smells for seven days. You'll be able to forget all about your cat's litter tray - no need to remove clumps every day! The fine, pink grains are gentle on your cat's paws. The colouring is obtained safely using food colouring. All advantages of Sanicat 7 Days Aloe Vera Cat Litter at a glance: 100% natural litter for cats and kittens High absorption: liquids are quickly absorbed and neutralised Dust and odour free Maximum hygiene for a whole week Air freshener: pleasant and natural aloe vera scent Non-clumping Effective for one cat for up to 7 days No need to clean out clumps daily Fine pink grains are gentle on your cat's paws This package includes 5 packs of 4 litres.